… Mont Blanc. 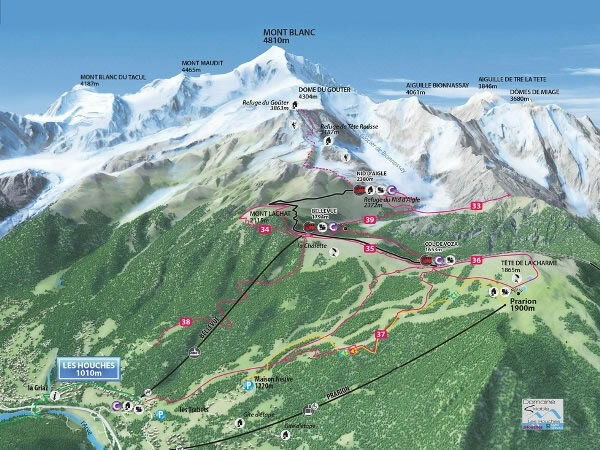 This diagram shows the route we took to reach the top of Mont Blanc. First, we went to Les Houches, a small village about 8 kms / 5 miles south-west of Chamonix. We then caught an aerial cable car from Les Houches to Bellvue, where – after waiting for a while in the sunshine on a pleasant summer’s morning – we caught a train to Nid d’Aigle. We then hiked and scrambled our way up to the Refuge de Goûter, where we spent the night prior to climbing to the summit of Mont Blanc.